Ongoing Linux Voyages – Carl Helmers — Technical Story Teller and Thinker — self publishing again now on the WWW. What you do after founding BYTE, Bar Code News then Sensors dead tree magazines in the prior age. Fedora 25 was released November 22. I downloaded its live DVD .iso image after breakfast, morning coffee and e-mail. Then I realized that I had forgotten one crucial last step of last June’s Fedora 24 installation to both of my desktop machines: I did not yet have not yet installed the K3b distribution-agnostic GUI DVD creation tool. I have been using K3b since a LUGOR colleague in the Rochester N.Y. area suggested it to me as I got back into Linux circa 2006 to 2008. I probably first used K3b for to burn a Fedora 13 or 14 DVD then while Fedora 15 to 17 in my recollecte opinion had unusable GUIs I found the eminently usable Cinnamon GUI first in Linux Mint for several Linux Mint releases. When finally (Fedora 20?) Fedora began having the easily installed Cinnamon GUI option, I went back to using Fedora, my present choice of Linux distribution. The beauty of open source and Linux is that my key applications: Libre Office (Writer, Calc etc) GIMP, Thunderbird, Firefox,etc with minor cosmetic differences could care less about which Linux they run under. This tool, out of the Debian Linux branch, is what I used to transfer my downloaded .iso image files onto bootable installation DVDs, the first step of the next installation after download. So it turns out that my first step for installation of Fedora 25 was to install K3b into Zeus, my HP Pavilion “test” machine whiThen then, after realizing that I had forgotten to install the K3b installing a forgotten k3b mail.t 09:50:57 s soon as it was available. Fooled by a forgotten screenshot! In addition to its real time weather radar, real time clock display and current weekday MarketWatch Financial DJIA & NASDAQ real time display functions, I use Zeus as my experimental Linux computer when I want to try out some Linux distribution. During experimental installations I temporarily forgo use of my standard displays on the upper LCD until I have set them up again after a new installation. /home/LL/H/ for various history files created in the course of the initial boot process. I pipe the BASH date command into the file /home/LL/H/date-of-boot as my first BASH command after the end of the bootstrap process. This is specified by my crontab@boot line calling my custom shell /home/LL/CH-ZeusCboot (for my “Zeus” computer.) In my CH-ZeusCboot BASH shell the first command executed (absolutely minimal delay) is the BASH date command directed to the intermediate file /home/LL/H/date-of-boot. This gives me a good approximation to the actual boot epoch (date and time) as a standard date command output. At an unknown and irrelevant delay time later in the CH-ZeusCboot shell, I cat the file /home/LL/H/date-of-boot into the pipe into my Perl /home/LL/P/form-history-date.pl program in order to get an “epoch” format date string for use in my history logs. My “epoch” format date is a more natural readable format of date as opposed to the “format of convenience” used by the first Unix coders that resulted in the date command’s output format. tAs an example the epoch of my login on an April 2016 morning is: Tue Apr 19, 2016 @ 06:40:48 EDT created by cat piping the Linux date format /home/LL/H/login-date ( Tue Apr 19 06:40:48 EDT 2016 ) into a pipe into my form-history-date.pl then into the file /home/LL/H/epoch-of-login. The main difference is that I move the year to its proper position in an American English expression of a date following the day of the month and I add the characters ” @” before the HH:MM:SS format 24-hour astronomical time field used by Linux. Of course I use the effective time zone 3-digit abbreviation for Eastern Daylight time based on my New York location and the current day within the year. http://bigcharts.marketwatch.com/… for DJIA and NASDAQ stock market charts when markets are open. While creating my non standard directories, as well as developing some further “.pl” perl programs I had to make the new program files executable — whether the files were simple shell script text files or .pl perl programs. Out of bad non-GUI habits command line habits I used a BASH shell window rather than the GUI file properties window to mark the new program files as “executable” so I could run them. After I had a shell window activated for other purposes, for some reason I used the screenshot GUI tool. I inadvertently left it in the default “grab the whole screen” mode while taking my screenshot. Well the whole screen includes my usual desktop background as well as my terminal window and Firefox browser windows. Remember, a screenshot of a terminal window looks just like an active working terminal window. The …/Pictures/ directory happens to be the default directory from which to select desktop backgrounds as well as the default destination directory for the Screenshot application. Compound that with my inadvertent selection of the abnormal screenshot as my desktop background when I was configuring Korora 23 Cinnamon in Zeus. Now I know why I ended up with a “frozen” terminal window that just would not close when I clicked its “X” dot in the upper right corner! By going back to preferences I found that my options included my intended custom desktop background for the Korora 23 distribution without the terminal window image, as well as the inadvertent potential wallpaper image of my screenshot with the BASH GUI window and similarly frozen images of my weather and time windows. Picking the correct image I solved my problem. So now I know yet another potential gotcha of the occasional installation of a Linux, an act that I do not do every day! Some details are worth cluttering into one’s memory rather than being tossed over the transom when using the system normally for weeks or months after the last installation! http://www.helmers.com/wp-content/uploads/2015/01/CH-Linux-Breakthrough-2015-01-20-300x65.jpg 0 0 Helmers Carl http://www.helmers.com/wp-content/uploads/2015/01/CH-Linux-Breakthrough-2015-01-20-300x65.jpg Helmers Carl2016-04-19 14:08:312016-04-20 10:16:26Fooled by a forgotten screenshot! Late this afternoon [August 4, 2015] I downloaded the new Korora 22 spin of Fedora 22 — twice. The first time, I somehow picked the KDE spin to download. I followed up on my mistake before dinner by using K3b in Zeus (under its Linux Mint 17.1) to burn the Korora 22 KDE live DVD. With the KDE isodoeloaded and burned now I could possibly try out a new GUI spin “live” in my experimental computer Zeus. But I really wanted the Korora 22 Cinnamon spin for A to B comparison with the real Fedora 22 Cinnamon GUI that I have been using in my main computer Thor since it became available. But either in the download or the DVD burning process, I ended up with a non-working Korora 22 live Cinnamon DVD. My initial experiment failed in a frozen non-GUI boot display that I ended up killing by powering off Zeus. Not quite ready to quit on the day, I then set Zeus up with the Korora 22 KDE DVD instead in its tray. Since I had never used KDE before, I could initially prove that the DVD I made worked, then get a taste of KDE without actually following through tonight with a real install. The Korora 22 live DVD (in its pokey live DVD way) loaded with no trouble in Zeus. Since today is one of those summer days when I need the real time thunderstorm radar on my upper screen, I shortly thereafter shut down Zeus again, removed the Korora KDE DVD, in order to reboot Zeus and restore my normal www.wundergorund.com radar in my upper display. I write tonight’s note from Thor about my initial Korora 22 experience in the hour or so before the next T-storm cell (seen on Zeus’s upper LCD) marches west to east from lake Erie west of Buffalo NY to our position south of Rochester… That’s it for now. 2015.07.24 — Fedora 22 printer problem solved… Soon after I installed Fedora 22, I was unable to print on my 2015 purchased HP OJ-P 8620 which is USB connected directly to Thor, my main desktop Fedora Linux workstation. This is a major gotcha. Since last installing Fedora 22 this printer hardware had not worked. Today, I tried the Fedora superuser command “dnf update” to see if any changes had been broadcast. After maybe 10-15 minutes of downloading then doing the updates, I did a power cycle of Thor and what do you know, now I had printer function back! When using software at the bleeding edge [AKA Fedora nn] it pays to update frequently! I imagine that when I next go into the “System Settings” of cinnamon on Thor, I will find the missing printer is actually there! Jean and I just spent a week at the Phoenix Az Biltmore Hotel, where her INRC (International Narcotics Research Conference) combined with the CPDD (College on Problems of Drug Dependance were held jointly this year. I go along for the ride on her scientific trips, since it offers the prospect of visiting new places or variations on previously visited places. I will post some photos later when I get around to dumping my pix from camera to this computer. While Jean attended sessions of the two successive meetings, I read infor on Fedora 22 and its installation so I could plan today’s partially completed installation/configration activities. 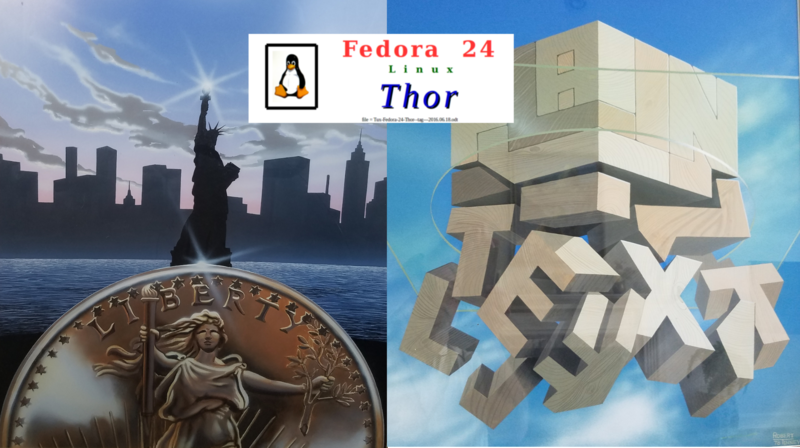 We got back home last night late Eastern Daylight Time; in between our post trip laundry chores etc, today I installed Fedora 22 in Thor for the perhaps ultimate, so far successful time. I am just now exploring my chosen Cinnamon GUI which in its latest Fedora instantiation seems as comfortable to me as earlier versions in Fedora and Mint. I have yet to tweak everything the way I would like it to be. There are some gotchas and compromises that I have not figured a way around yet. If frustrated enough I may yet try the another GUI available through Fedora. This evening the remaining exploration is Thundernbird e-mail, which I will adopt initially by the kluge of copying the configured .thunderbird directory of my last Fedora 20 installation since I know it has worked in the past. Later after the Korora/Fedora tests, as summer 2015 progresses I hope to finally attempt to get around to re implementing my BASEL Bash Application for System Event Logging as PASERL, my new Perl Application for System Event Recording – Logging. This may seem excessive. But I never liked the somewhat less clean way of implementation as BASH shells with some important data extractions details done in Perl when needed. My idea is to make BASH the exception and Perl the principal language for my application rather than use Perl as the exception with BASH as the normal coding paradigm. I also want to try making it more distribution independent so that I can ultimately use the same or very similar Perl program with my Mac Airbook travel computer. I may still have to use an expression piping Bash “last” into “head” into “grep” to get the halt, start and login times I seek eachepoch when a system changes its respective state. However, the use of Perl rather than BASH to post these times to a /home/local-logs/PASERL-history file may be symbolically neater when I am done. Mint now provide remixes of Debian. I first started going to Lugor meetings after moving back to ROC. what Ubuntu and Mint do for Debian and each other. real time weather radar box that currently runs Mint 17.